For each species, the model contains the diffusion of individual beings, the birth rate , the saturation rate or concentration , and the aggressiveness rate . Starting from an initial condition, a distribution of and in the regarded domain, above equations with additional constraints for well-posedness will describe the future outcome. In the long run, this could either be co-existence, or extinction of one or both species. In case of co-existence, the question is how they will separate on the assumed radial bounded domain. For this, he adapted a moving plane method. On a bounded domain, the given boundary conditions are an important aspect for the mathematical model: In this setup, a homogeneous Neumann boundary condition can represent a fence, which no-one, or no wolve, can cross, wereas a homogeneous Dirichlet boundary condition assumes a lethal boundary, such as an electric fence or cliff, which sets the density of living, or surviving, individuals touching the boundary to zero. The initial conditions, that is the distribution of the wolf species, were quite general but assumed to be nearly reflectional symmetric. The analytical treatment of the system was less tedious in the case of Neumann boundary conditions due to reflection symmetry at the boundary, similar to the method of image charges in electrostatics. The case of Dirichlet boundary conditions needed more analytical results, such as the Serrin's boundary point lemma. It turned out, that asymtotically in both cases the two species will separate into two symmetric functions. Here, Saldaña introduced a new aspect to this problem: He let the birth rate, saturation rate and agressiveness rate vary in time. 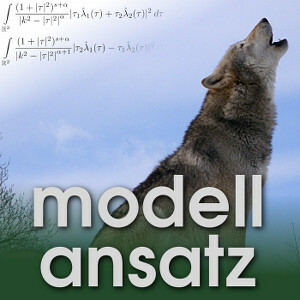 This time-dependence modelled seasons, such as wolves behaviour depends on food availability. The Lotka-Volterra model can also be adapted to a predator-prey setting or a cooperative setting, where the two species live symbiotically. In the latter case, there also is an asymptotical solution, in which the two species do not separate- they stay together. Alberto Saldaña startet his academic career in Mexico where he found his love for mathematical analysis. He then did his Ph.D. in Frankfurt, and now he is a Post-Doc in the Mathematical Department at the University of Brussels. A. Saldaña, T. Weth: On the asymptotic shape of solutions to Neumann problems for non-cooperative parabolic systems, Journal of Dynamics and Differential Equations,Volume 27, Issue 2, pp 307-332, 2015. A. Saldaña: Qualitative properties of coexistence and semi-trivial limit profiles of nonautonomous nonlinear parabolic Dirichlet systems, Nonlinear Analysis: Theory, Methods and Applications, 130:31 46, 2016. A. Saldaña: Partial symmetries of solutions to nonlinear elliptic and parabolic problems in bounded radial domains, PhD thesis, Johann Wolfgang Goethe-Universität Frankfurt am Main, Germany, 2014. A. Saldaña, T. Weth: Asymptotic axial symmetry of solutions of parabolic equations in bounded radial domains, Journal of Evolution Equations 12.3: 697-712, 2012.